NOTE: This is a 4 1/2 ft. x 9 ft. Brunswick & Balke Co. manufactured "Exposition Novelty" model table, with a basewood of stunning true Brazilian rosewood. 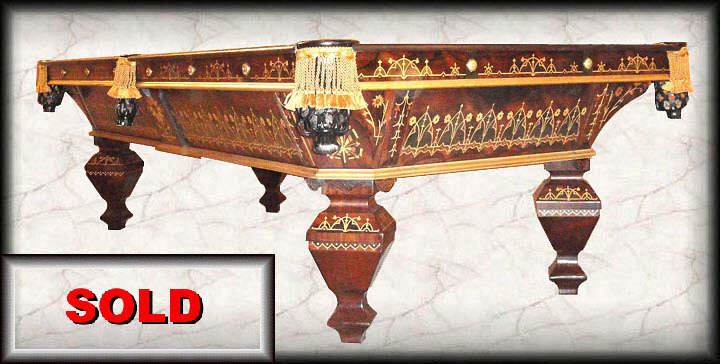 The inlays used in its remarkable marquetry design, the most elaborate pattern Brunswick ever implemented, are: satinwood, tulipwood, carpethian elm burl, ebonized amaranth, and burled walnut. Shown without it's two side and end "skirts," which are currently being professionally made and will very soon be on the table, this is only the 3rd example we've found of this rare and highly sought table in our 35 years in the "antique pool tables" business! This table will now, once again, play excellent pool. Note: Our very popular, gigantic, and comprehensive 288 page, hardcover, ALL COLOR, antique billiard collectibles price guide book is also available on our "Billiard Accessories" page.